After a decade of releases that brought diminishing financial and critical returns, M. Night Shyamalan bounced back a little with 2015’s The Visit. No, that film didn’t excel at the box office, but it became Shyamalan’s first movie since 2004’s The Village to actually turn a profit. Another super-low-budget affair, 2017’s Split did even better. Though it cost a mere $9 million, Split brought in about $270 million worldwide. Given the common notion that a movie needs to make about three times its budget to go into the black, I’d say a film that brought in 30 times its cost did pretty well financially. It remains to be seen if Shyamalan can continue this upward trajectory with his next effort, but as someone who enjoyed his early flicks, I felt pleased to see his renewed good fortune. I just wish I actually liked Split, but the movie turns into a goofy disappointment. A mysterious man (James McAvoy) kidnaps three teenage girls: Casey (Anya Taylor-Joy), Claire (Haley Lu Richardson) and Marcia (Jessica Sula). After he imprisons them in a dungeon-like setting, they attempt to strike back, but they discover an unusual obstacle. The assailant demonstrates multiple personalities, so the girls need to deal with a variety of “characters”. We follow their attempts to cope with their situation and escape their kidnapper. I was reluctant to see Split because the trailers made it look silly and campy. However, it got pretty good reviews, so coupled with its commercial success, I decided to give it a look. I should've trusted my original instinct. Yeesh, what a dopey movie! From literally the very start, the film abounds with idiocy and plot holes - Mack truck-sized plot holes, and moments beyond any possible belief. Shyamalan's script seems engineered to prevent tension or suspense. He spends far too much time away from the main setting so we can hang out with the kidnapper’s therapist Dr. Fletcher (Betty Buckley) and have her explain everything to us in neat, tidy terms. A better-written screenplay would've found a more efficient way to do this that kept us within the claustrophobic confines of the girls' prison. Every time we head out to hear from Betty Buckley again, drama subsides and we just get endless Basil Exposition segments. McAvoy camps up a storm as all his characters. He does transition among them well, but he makes none of them memorable or effective. He just seems ridiculous most of the time as he overacts relentlessly. The entire flashback subplot related to Casey's backstory seems superfluous and gratuitous as well. I suspect Shyamalan believed he was making a point about child abuse, but in truth, his observations add nothing. Whatever reality the movie espouses in terms of people with multiple personalities, Shyamalan flushes those notions down the toilet as matters progress. By the time the flick hits its final act, these facets become laughable - literally, as I couldn't maintain a straight face when Kevin's "final personality" revealed itself. Really, the only enjoyable aspect of the movie comes from a reveal/cameo at the end. The rest of Split provides campy absurdity with little reward. Split appears in an aspect ratio of approximately 2.40:1 on this Blu-ray Disc. The visuals excelled. Sharpness worked nicely, as despite some challenging settings, the image offered strong delineation. Virtually no softness marred this tight, accurate presentation. I saw no shimmering or jaggies, and both edge haloes and print flaws remained absent. Colors opted for the usual teal and orange, though in a low-key manner. This left the hues as subdued and well-rendered for the desired impression. Blacks were dark and deep, while shadows – an important factor given the many low-light interiors – appeared clear and smooth. This became a top-notch image. Given the nature of the story, the DTS-HD MA 5.1 soundtrack emphasized atmospheric material, which it did well. The mix created a creepy, oppressive sensibility that used the various channels to form its narrative needs. Though this left few chances for sonic excitement, a smattering of more dynamic sequences materialized. 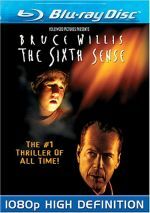 Most of these moments came from the movie’s action-oriented climax, as that part of the film delivered a reasonable amount of involving material. Audio quality worked nicely. Speech appeared natural and concise, while music sounded full and rich. Effects offered good clarity and accuracy, with deep low-end response when necessary. Though not consistently exciting, the soundtrack suited the story. 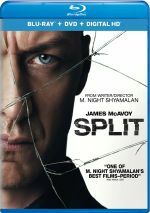 The Blu-ray provides three featurettes, and these start with The Making of Split. During this nine-minute, 50-second program, we hear from writer/director M. Night Shyamalan, executive producer Ashwin Rajan, producer Marc Bienstock, production designer Mara LePere-Schloop, and actors James McAvoy, Anya Taylor-Joy, Jessica Sula, Haley Lu Richardson, and Betty Buckley. We learn about the project’s roots and development, story/characters, cast and performance, the tone on the set, cinematography and visual design, sets and locations. A few minor insights result but much of “Making” seems superficial. The Many Faces of James McAvoy fills five minutes, 38 seconds with notes from McAvoy, Shyamalan, Rajan, Buckley, Taylor-Joy, Richardson and producer Jason Blum. “Faces” examines McAvoy’s characters and performance, with an emphasis on praise. That makes it a less than informative piece. For the final featurette, we find the three-minute, 40-second Filmmaker’s Eye. It involves Shyamalan, Sula, McAvoy, Buckley, Blumhouse, Rajan, LaPere-Schloop, Taylor-Joy and executive producer Steven Schneider. “Eye” discusses Shyamalan’s work on the set, and it does so in a fluffy manner. Like its predecessors, it offers a few good thoughts but mainly just lavishes plaudits on its subject. In addition to an Alternate Ending (0:32), we locate nine Deleted Scenes (14:37). As implied by its brief running time, the “Ending” lacks much substance, so don’t expect much from it. The various deleted scenes prove to be up and down, but some interesting material emerges. We find a character named “Professor Shaw” who doesn’t make the final film at all, and we see his connection to Dr. Fletcher. Since we spend far too much time with Dr. Fletcher already, these scenes deserved to be cut, especially since they do nothing to advance the main storyline. The others tend to be more minor in nature. They expand existing sequences and add a little exposition and character material. Nothing significant comes from these. Note that the “Ending” and all nine deleted scenes can be viewed with or without introductions from Shyamalan. He lets us know a little about the sequences as well as why he cut them. Shyamalan adds useful information during the intros. The disc opens with ads for The Mummy (2017), The Bye Bye Man, Mind Gamers, The Great Wall and Incarnate. No trailer for Split appears here. A second disc provides a DVD copy of Split. It includes the same extras as the Blu-ray. Though I feel happy to see a commercial bounce-back for M. Night Shyamalan, Split fails to deliver a satisfying thriller. The movie suffers from ludicrous leaps of logic and turns into a silly mess. The Blu-ray provides excellent visuals as well as positive audio and a smattering of bonus materials. Parts of Split show promise but the end result lacks consistency and dramatic impact.